Paul Hart leaves QPR after just five games – what is Flavio Briatore on? The revolving door on the manager’s office at Loftus Road has struck another unlucky schmuck on the backside this morning as Queens Park Rangers have confirmed that Paul Hart has left the club after just five games in charge. Hart becomes the sixth full-time managerial casualty at QPR since Flavio Briatore was installed as chairman in August 2007; Iain Dowie, Jim Magilton and Paolo Sosa (amongst several others) have all met with similar fates during the impatient Italian loon’s tenure at Loftus Road, with other ‘caretakers’ also coming and going in that time. The circumstances surrounding Hart’s departure are still unclear with some sources blaming a fall out with the board (which seems highly feasible) over transfer dealings and others citing a recent falling out with Adel Taarabt as the reason for the former Portsmouth manager’s sudden exit. 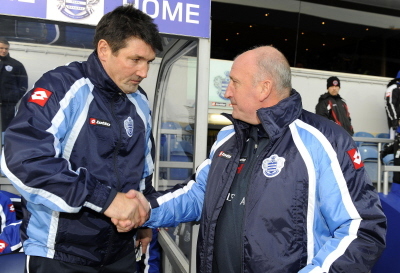 Assistant manager Mick Harford has been handed the reigns on a temporary basis until the end of season – if he makes it that far. What do you make of Briatore, QPR fans? I guess there aren’t that many QPR fans. I do not have a problem with Flavio. He is not sitting in his office saying lets get Ian Dowie – Jim Magilton or I must have Paul Hart somebody is telling him who to have. He has backed the managers when they have said that players are needed. To date I think we have bought in some 40 players to the club. Agian he his being told who is needed. QPR fans may not like the players but at least new players are arriving. I agree we need satbility at the club but is it wrong that a Chairman wants success. Ideally Di Canio had he chosend not to retunr home would have got us where we should be. We will be mid table by the end of the season so as long as we buy Curbishley then no worries. this season is over for us. While I feel as though we are a laughing stock in the eyes of others, as a QPR fan, I still hold onto some hope that one day the purse strings will open and finally we will make the right investment in personnel both on and off the pitch. But it starts with either Coppell or Curbishley. I really think that once we have a ‘branded name’ in the hotseat, our FORTUNES will change for the better. I do think we’ve left it too late this season though. There is something horribly wrong when a manager quits so quickly. Somebody there must be causing a lot of trouble. It needs sorting once ad for all. He’s Italian, they go through managers faster than a pack of cigarettes.